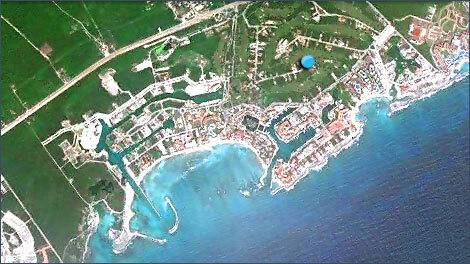 Puerto Aventuras is located in the heart of the Riviera Maya on the Mexican Caribbean. Here you will find a magical blend of lush tropical beauty with an easygoing yet sophisticated life style. Pamper yourself with a unique experience. Puerto Aventuras is a private gated community located 20 minutes south of world famous Playa Del Carmen and 30 minutes north of Tulum the Mayan Ruin site located on the beach where it is known that Mayan Kings Vacationed and it is all located in the heart of Mexico's Riviera Maya on the Mexican Caribbean and as well in the middle of the most famous caverns. If you are thinking about vacationing in this beautiful destination you will not be disappointed. Travelers to Puerto Aventuras can enjoy their vacations in the comfort of Luxury 5 Star Hotel accommodations like the Omni Puerto Aventuras or you can choose one of the all inclusive or 4 star options available. And the caverns are right around the corner. If you want more of the comforts of home while on Vacation in Puerto Aventuras you can rent one of the many condos, villas or houses that line the beach, marina, and golf course. Puerto Aventuras has everything from Studios on the Marina to Luxury Estate Homes on the Beach and Golf Course that can be rented by week or month, most are luxury furnished and have maid service included or available. Whatever option you choose for your visit to Puerto Aventuras you will find so many activities, restaurants and shopping just a short walk from your door. Once you visit Puerto Aventuras we are sure that you will consider making it your home in the Caribbean.